The city of Aspen, CO has approved a plan to add 27 electrical outlets to their Rio Grande Parking Garage so NEV owners can recharge their vehicles when parking them overnight. Since NEVs are no emission vehicles they are allowed to park for free and owners use them while in town during the day. Later today Smith Electric Vehicles U.S. Corp is expected to announce that they have chosen Kansas City, MO as the site for their assembly plant. The plant will be located near the Kansas City International Airport and is expected to eventually employ 200 people within three years. 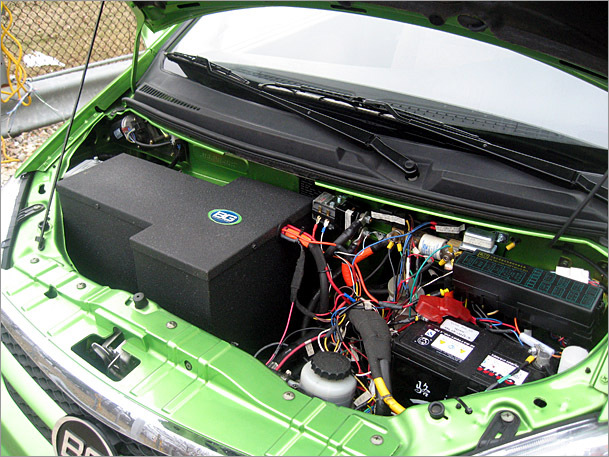 The consortium involving Ford and British based Tanfield Group is expected to invest $5 million in the plant that will produce an electric version of Ford’s Transit Connect delivery vans and Smith’s Newton electric truck. The first vehicles to be produced will be the Newtons with a third quarter launch date as the target. The company expects to produce 10,000 vehicles annually for a US market estimated to be 200,000 for delivery trucks of this size. The Transit Connect vehicles are expected to roll off the line in 2010. You can find some video reviews of Smith Electric Vehicles Newton from a recent trade show here. The industry professionals had a generally positive response to the vehicle. Evergreen Electromotive based in Bainbridge Island is raising funds to finish additional prototypes and establish production facilities for three-wheeled utility vehicles. Led by Bob Fraik, a former software engineer from Sun Microsystems and NeXT, the company has already produced the ECH, a four wheeled MSV prototype with a carbon composite body and lithium iron phosphate battery pack giving it a range of 80 miles. Think Global has signed a memorandum of understanding to supply 500 Th!nk vehicles in 2009 to Elmonet for sale in The Netherlands. Elmonet is a subsidiary of Mobility Service Netherlands. The cities of Amsterdam and Rotterdam are expected to be key markets. The Dutch government has developed a 10 million euro fund to advance the introduction of electric vehicles. This round up features some action in Canada, Wisconsin, Colorado and some other states as well as signs of growing interest in medium speed vehicle regulations. Grand Chute, WI – Town asking state for help regarding the use of NEVs on some of the many roads under state jurisdiction that criss-cross the city. Loveland, CO – House Bill 1026, which would allow neighborhood electric vehicles on public highways, passed the Judiciary Committee and will be going to a House vote. North Vancouver, Canada – City council rejects staff recommendations to wait for additional LSV safety standards before allowing vehicles on roads. Sedona, AZ – Public transportation commission recommends feasibility study to look at NEVs as a public transportation option. British Columbia, Canada – Motor vehicle regulations amended to allow incidental use of roads by utility vehicles during their normal off-road use. Kennebunk, ME – ZAP Xebra three-wheeled truck doesn’t pass registration as a motorcycle and therefore cannot be legally driven. Amendment to address issue in process. Flower Mound, TX – Transportation commission is urged to look at LSV regulations in anticipation of increased usage of the vehicles. South Daytona, FL – After a favorable feasibility study, city officials are moving ahead on allowing golf carts to be used on city streets. Manitoba, Canada – Manitoba province is looking at enacting similar legislation as Ontario and Quebec to allow LSVs on public roads. Medium Speed Vehicle Regulations – At the end of February nine states were considering medium speed vehicle laws: Hawaii, New Mexico, Kentucky, New York, Oregon, South Carolina, Georgia and Colorado. Speed limits proposed ranged from 35mph to 50 mph with most at 45 mph. Five states who have already adopted MSEV laws include Washington, Montana, Minnesota, Oklahoma, and Tennessee. BG Automotive recently showed a prototype of their C100 NEV to Massachusetts officials in hopes of generating financial support for production facilities in the state. They are also looking to obtain funding from the US Department of Energy. The C100 features a 48 volt, 18 hp electric motor powered by eight lead acid batteries and has a range of 60-80 miles according to the company. Except for the controller, motor and batteries which are produced in the US, the rest of the vehicle’s parts are produced in China. Price range will be $16,000 to $18,000. A Boston Globe reporter took the vehicle for a parking lot test drive and had a mixed review. 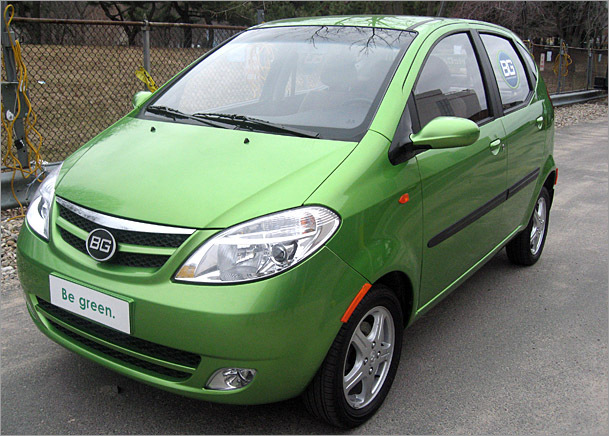 Update 3/23: The article is updated to note that the vehicle is actually the Chang’an Ben Ben or Chana Benni produced in China.